A new year, new faces, same game. 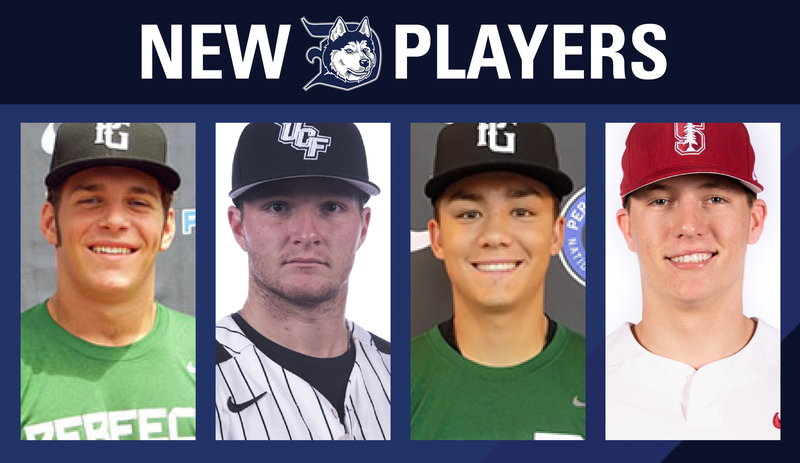 The Duluth Huskies Baseball Club is excited to announce the signing of four more players signing for the 2019 season. To include many different positions with outfielder Preston Hartsell, catcher/infielder Tyler Lozan, right-handed pitcher Justin Moore, and catcher/infielder Anthony George. Preston Hartsell, a freshman at the University of Southern California, had an impressive high school career at Corona Del Mar with playing varsity all four years being named All-American his junior and senior year along with being ranked the best outfielder in California for his senior Class of 2018 by Perfect Game. He ended his high school career with a batting average of .396. Tyler Lozano, a freshman at the University of Southern California, had an intense high school career at Saint Mary’s in Stockton, California. Where he earned Cali-Hi Sports All-State, All-NorCal, All-Area, and All-League honors, all within his senior year. Along with his senior stats, he collected a batting average of .537. Had an on-base percentage .604. Lozano also played two years for Club All-Star in Stockton. Anthony George, a reserved Junior at the University of Central Florida started his season off rough with being injured and being forced into becoming a redshirt by the NCAA. As a sophomore, he appeared in 42 games and started 27 of them. His end of season stats was a batting average of .294 along with 10 RBI. He had an overall successful season with multiple perfect three-for-three stealing bases along with scoring Home runs in multiple games. Look for these four athletes along with the rest of the Huskies at their home opener on Sunday, June 2nd, 2019 against the Eau Claire Express. Until then don’t forget to stay connected with the Huskies on the official website duluthhuskies.com and on all social media platforms, including Twitter, Instagram, and Facebook.